The monsoon arrives in India in June, so it's an excellent month to enjoy the wet weather at a monsoon festival in India! Otherwise, head north to the mountains to catch some popular festivals and events. Here's the best of what's on in June in India (listed by date). The holy Muslim month of Ramadan is a fantastic opportunity to feast on fresh street food. During Ramadan, Muslims traditionally fast daily from sunrise until sunset. In the evenings, the streets in traditional Muslim areas are flooded with people and the tantalizing aroma of meat being freshly roasted to feed the famished. The revelry continues all night. Ramadan concludes with he festival of Eid-ul-Fitr, with more feasting and shopping. When: May 6-June 5, 2019. Where: See Mumbai and Delhi. Also Lucknow and Hyderabad. 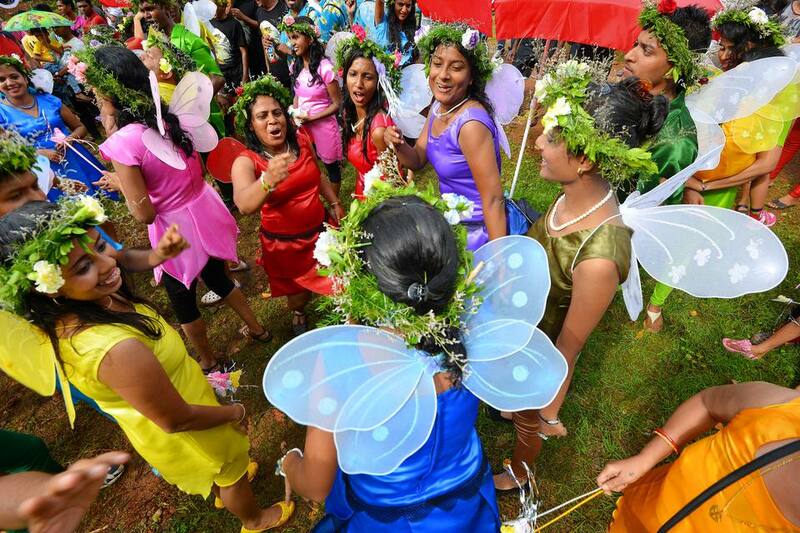 The annual 28 day Kottiyoor festival takes place at two temples -- Akkare Kottiyoor and Ikkare Kottiyoor -- on opposite sides of the Bavali River and surrounded by dense forest. The Akkare Kottiyoor temple is only open during the festival. There's no formal structure. Rather the idol of the deity, a swayambhoo lingam (self-created idol of Lord Shiva), is seated on the ground and formed by a small heap of stones called manithara. The Neyyattam ritual on the first day and the Thirukalasattu ritual on the last day attract the most spectators and devotees. When: May 17-June 13, 2019. Beat the rain by heading north to the mountains in Shimla, to experience the annual summer festival. This renowned event has been held regularly in Shimla since the 1960s. It features musical performances, some from famous singers, food and fashion. Plenty of local handicrafts are on sale too. To get there, travel on a toy train to Shimla. When: First week of June. The occasion of Sital Sasthi, which celebrates the marriage of Goddess Parvati and Lord Shiva, provides a remarkable opportunity to see thousands of folk artists performing dying art forms in Odisha. The performances are part of a carnival-like marriage procession, which also features the deities. The festival was started about 400 years ago and is held to encourage an abundant monsoon (Shiva is believed to represent the scorching summer heat and Parvati the first rain). Daniel Berehulak / Getty Images. The Ganga Dussehra festival is celebrated to mark the time that the holy Ganges River descended to earth. A large number of pilgrims congregate alongside the holy river, to bathe in it and worship. Read more about the Ganga Aarti in India. Where: Varanasi in Uttar Pradesh, and other holy cities along the Ganges such as Haridwar and Rishikesh. This unusual festival is a mock fight that commemorates the historic battle between the Kayamkulam and Ambalapuzha kingdoms in medieval times. Men dressed as warriors enter a waterlogged wetland and engage in combat, ceremoniously to the beat of drums, using sticks. Where: Wetland near Ochira Parabrahma temple, Ochira, Kollam district, Kerala. Satyaki Basu / Getty Images. Saga Dawa is the fourth month of Tibetan lunar calendar and the holiest month for Tibetan Buddhists. The most important celebration falls on the full moon day of the month, when the birth, enlightenment and death of Lord Buddha is honored. In Gangtok, a procession of monks carries the holy book from Tsuklakhang Palace Monastery around town. It's accompanied by the blowing of horns, beating of drums, and burning of incense. Colorful masked dances also take place at Rumtek Monastery. Where: Gangtok, and other monasteries throughout Sikkim and Darjeeling. An usual Tantric fertility festival, the Ambubachi Mela marks the menstruation period of the Goddess Kamakhya. The temple is closed for three days while the Goddess menstruates and reopens on the fourth day, with a rush of devotees who come to receive bits of cloth that are supposedly soaked with her menstrual fluid. It's considered to be extremely auspicious and powerful. The festival attracts numerous Tantric sadhus (holy men) from India and abroad. Some of them only appear in public during the four days of the festival. They perform unique rituals and exercises that are widely photographed. The festival is also popular for its rural crafts fair. Where: Kamakhya temple, Guwahati, Assam. The most popular festival in Goa, Sao Joao (the fertility feast of Saint John the Baptist), involves the interesting feat of men jumping into overflowing village wells to retrieve bottles of local feni alcohol. There are also boat races, and singing and dancing. Where: North Goa, particularly Siolim. This monsoon celebration, by Goa's local fishing communities, sees people sailing up river on rafts while performing plays and songs. Visit Ladakh before the peak season starts to catch the Yuru Kabgyat festival at Lamayuru Monastery, the oldest monastery in the region. Two days of sacred masked dances and other rituals take place against a spectacular setting atop a steep hill. Music is a big part of the festival with monks playing cymbals, drums, and wind instruments. Where: Lamayuru Monastery, Ladakh. It's about two and a half hours from Leh, on the Srinagar-Leh Road, and can be visited on a day trip by cab. This delicious mango festival was started in 2013 by female mango grower Jyotsana Kaur Habibullah at her mango orchard, with the aim of promoting the region's mangoes, and supporting small farmers and women in agriculture. It takes place over three days and includes orchard visits, mango food festival, farmers market, cultural events, and a seminar. The finest mangoes are available for sampling and purchase direct from the farmers at the festival. There are also delicious mango delicacies, mango eating contests, and plenty of children's activities. Food at the festival is cooked by locals in the village. Folk music and dances will entertain the crowd under the mango trees. Where: Orchard Malihabad near Lucknow, and Janeshwar Mishra Park in Lucknow. It's mango season in India! Don't miss sampling the 500 varieties of mangoes on display at this popular, long-running annual festival that celebrates the much-loved "king of fruits". No, 500 is not a typo! Apparently, there really will be so many different varieties to try and buy, along with various mango products such as jam. A mango eating competition will also provide entertainment. Contestants will attempt to consume three kilograms of mangoes in three minutes.